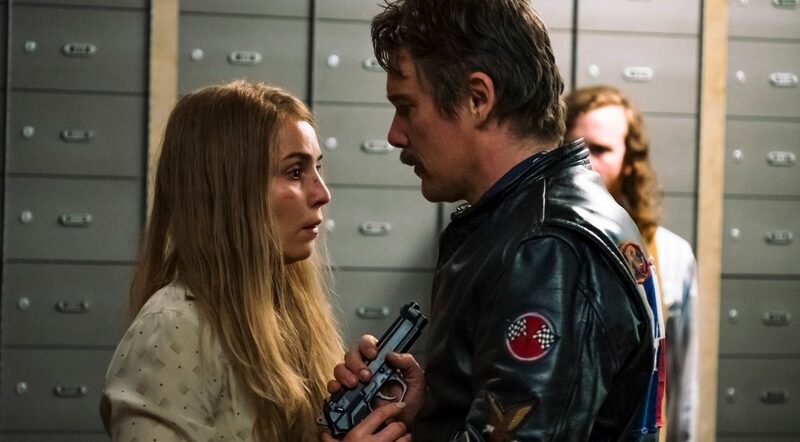 Ethan Hawke, Mark Strong, and Noomi Rapace star in the first movie about the bank robbery that inspired the term "Stockholm Syndrome." On August 23, 1973, a convict by the name of Jan-Erik Olsson tried to rob the largest bank in Stockholm while he was on leave from his stint in prison. Olsson carried a machine gun, and he took a few hostages, but he wasn’t a jerk about it or anything; he was reasonably kind to the bank tellers, he only hurt people by accident, and — as the day wore on — he even started singing Roberta Flack in the vault (the acoustics down there must have been fantastic). There have been any number of films about the uneasy bond that forms between a captive and their keeper, but director Robert Budreau’s “Stockholm” is essentially the first to trace this phenomenon back to the incident that inspired people to give it a name. Even if you counted the dramatization that aired on Swedish television in 2003, it wouldn’t change that the entertainment industry has done curiously little to exploit an infamous event that seems readymade for the big screen. “Dog Day Afternoon” with lower stakes and a loud thrum of quirky human warmth? The premise is basically (wait for it) money in the bank. How the hell has Stellan Skarsgård not starred in four different versions of this by now? The best thing you can say about “Stockholm” is that it’s good enough to prove that a much better film could be made from this story. And since Budreau’s angle is so bizarre, there’d be ample room for someone else to try. Promising that it’s “based on an absurd but true story,” this breezy, erratic, and eminently disposable caper leans into that absurdity from the start — from its cast list, even. To begin with, Olsson is played by Ethan Hawke, who previously delivered one of his great performances in Budreau’s Chet Baker biopic, “Born to Be Blue.” And rather than make Hawke strain to act more like the real person he’s playing, Budreau simply made the real person he’s playing be more like Hawke, to the point where the character needed a different name and nationality. It’s a big performance in a small movie — “The party has begun!,” Lars shouts to the rafters when he strolls into the unsuspecting bank — and Hawke makes a three-course meal out of every morsel of dialogue, but there just isn’t enough meat on the bone for anyone or anything else. It isn’t long before it starts to feel like Budreau is at the mercy of a character that he created. Lars is so over the top that he permanently lodges the movie in madcap comic terrain within the first five or 10 minutes, and “Stockholm” is never able to downshift towards the danger that its wild-eyed antihero is meant to project. Bank employee Bianca Lind (a wasted Noomi Rapace in a performance where her period-appropriate glasses are doing most of the heavy lifting) is a blank damsel in distress, while the subplot about her unexciting marriage is far too underdeveloped to sell us on the sexual tension that inevitably sparks between her and Lars. Or, more accurately, on the sexual tension that Lars forces onto her. If Hawke were less rakish and warm-hearted, perhaps it would be easier to think of him as a real threat to Bianca, but even she realizes that the bank robber would only hurt someone by accident. At one point, Lars admits that stabbing someone with a butter knife is the most violent thing he’s ever done. The robbery itself is so spur-of-the-moment that Boudreau’s script doesn’t even bother to ask viewers to invest in it. Instead, the brunt of the conflict is built into Lars’ friendship with Gunnar Sorensson (a wig that’s wearing Mark Strong), a childhood friend and former cellmate whose release Lars demands in exchange for some hostages. Gunnar is almost immediately deposited at the bank and left to decide which side if he’s going to defuse the situation or use it as an opportunity to escape. Strong can do this kind of thing in his sleep, but his character is the film’s only real wild card, and it’s fun to watch his gratitude for Lars’ thoughtfulness erode into frustration with Lars’ idiocy. Budreau is an assured filmmaker, and “Stockholm” gets a lot of mileage from his playful compositions and his ability to translate the mordant Skandanavian deadpan of a Roy Andersson movie into a breezy heist movie. At times, it feels as if Budreau resents that Lars gets to have all the fun, as the more serious moments that express Bianca’s unexpected warmth towards her captor — you know, the ones that make this story worth telling in the first place — are brushed over so that the film can get back to the more flippant business of trying to win the audience over to its side. The bits between Lars and Bianca are so quick and beige that it seems as though Lars is trying to will Stockholm Syndrome into existence. If he can just “Stockholm” her, then everything will be OK. If only Budreau could do the same to us, perhaps this strange tale of crime and sympathy wouldn’t be so much of a slog. “Stockholm” is now playing in theaters.